I don't yet have experience of making an adult size Liberty quilt though as a lifelong tana lawn obsessive I have sewn with it a lot. It's a fair question as the fabric seems so soft. 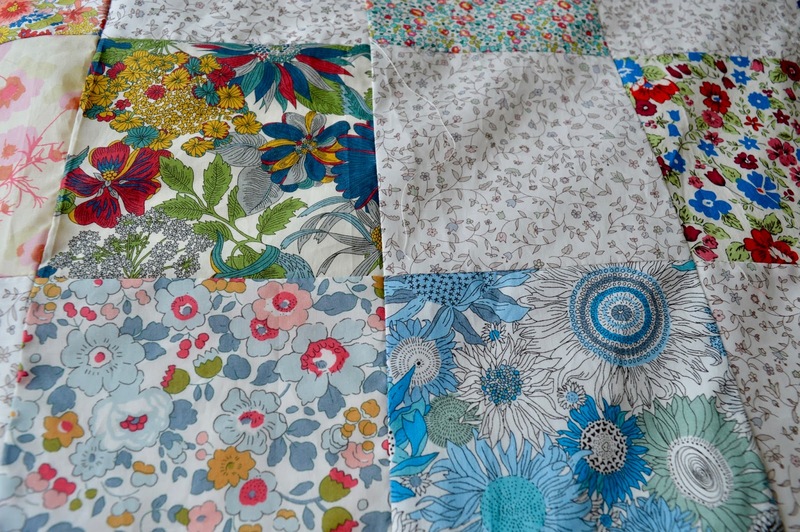 I looked up two quilts in The Liberty Book of Simple Sewing and two in The Liberty Book of Home Sewing and none of them back the tana lawn patchwork side and two use lawn as the quilt backing too. It will be glorious - good luck with the quilting! Jane i think it os delicious and also think that underlining it is a good idea. When I make a silk quilt I always foundation it with calico - it has to do with the seams pulling away more easily because of the lighter fabric. The thing is, I reckon you need a really light cotton to underline it with, like a voile, not something too solid like calico. It would sort of turn it into a double gauze, which is so lux. Then you can use a cotton or a wool batting inside it for ultimate soft scrumminess. Is there any Alma in it? I am so in love with that print since I saw it in your post about making ties. I've made a dress from it and have a piece of lantana for a cross season smock. Yum! Great advice, thanks Maryanne. Alas, there's no Alma in it - I wasn't far thinking enough to nab some from my friend Joe when he made his tie, Doh! I wouldn't think you'd need another layer under the top. Quilting should hold it all together, especially if you opt for an all-over design rather than just quilting in the ditch (along the piecing lines). After all, the quilting stitch is what's supposed to hold the top, batting and backing all together. Lovely piece and I hope it brings you years of warmth and comfort! You've done a superior job matching intersections. I would underline it just for the stability. It would also put less stress on the top fabric where there is stitching. 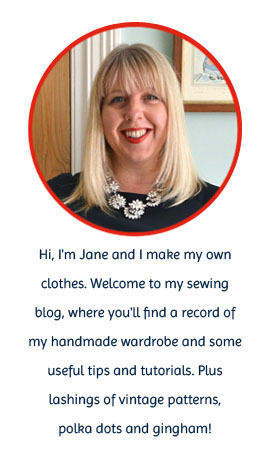 Are you planning on hand or machine stitching? Oh isn't that gorgeous! Obsessed with Liberty fabric, as my bank account will attest to, although most of it remains in stash as I'm too scared to use it. Hi Tana lawn may be soft but it is a very strong tightly woven cotton. You should not need to line it. Love your quilt. I think you should use a light underlining like a plain quilting cotton. The Tana lawn is lovely, but not as stable as quilting cotton. You might find it difficult to quilt (puckers, shifting) without a firmer fabric supporting it. I would have said that if you intended using the quilt then I would have underlined it with something light. I would have thought muslin a little too light. 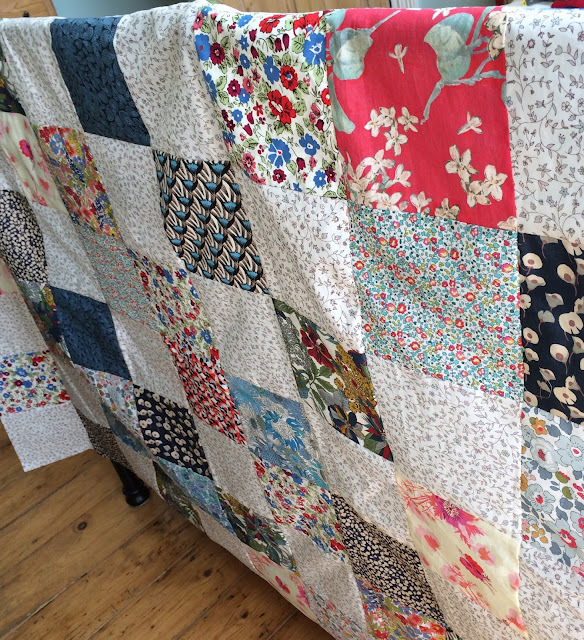 If you had handstitched your quilt I would definitely underline it after all that hard work. Its beautiful by the way cant wait to see the finished article. Jane your quilt is gorgeous! They are a lot of work; especially if you are going to quilt it at home on your machine. Whew! Looks like its a queen size? Really pretty. I have been quilting for over 25 years and have done a lot of quilts, honestly not any in Tana lawn, but that is cotton and it is strong. I wouldn't line your quilt, with the batting and backing and machine over all quilting; it will be a fine quilt. It should last a long, long time. Never pieced quilt in my life, but I'd be inclined to underline it with something light - voile, or more lawn. I think it's probably worth making the effort. it will be beautiful. Just use a good batting, I like Hobbs 80/20 myself. Way too much work to under-line it and it might bunch up or be hard to quilt through. Liberty is a good quality cotton. I have made some quilts Jane, and would ask you to consider a couple of things: if you want to hang the quilt, such as a wall quilt, then you do not have to have it lined. However, as you pointed out, Liberty lawns are very light; so an underlining of plain regular quilting cotton in a light shade would be advisable should you actually want to use the quilt. This would add stability, a little heft, and finish the quilt nicely as it would help it settle in during and after the quilting. Don't worry it won't quilt well, it will actually help since your Liberty is so light. I second the suggestions to use a good quality batting. If your quilt is washed, it should be washed in cool to lukewarm water at all times, preferably with an eco-type (gentle) liquid or powder washing solution. Very pretty by the way. My machine has a wavy line as an option. It would be an easy stitch to use to quilt ... just sew the wavy line over the sewing lines to make a grid. No need to obsess with perfection, and it looks like the squares are small enough that it would hold together well over time.